The Open Government Partnership (OGP) is a global initiative that aims to secure concrete commitments from national governments to promote open government, empower citizens and fight corruption to strengthen good governance. It was launched in 2011 on the sidelines of a UN General Assembly meeting. Today it has 75 participating countries, including Sri Lanka. Three years ago, addressing OGP summit, the British Prime Minister set out “the golden thread of four conditions” which allow any country to prosper- the rule of law, the absence of conflict, the presence of strong property rights and most importantly, the absence of corruption. Although the first three conditions are in order, the “most important” element – corruption - is missing in Sri Lanka. We do not have a strong track record in tackling corruption. 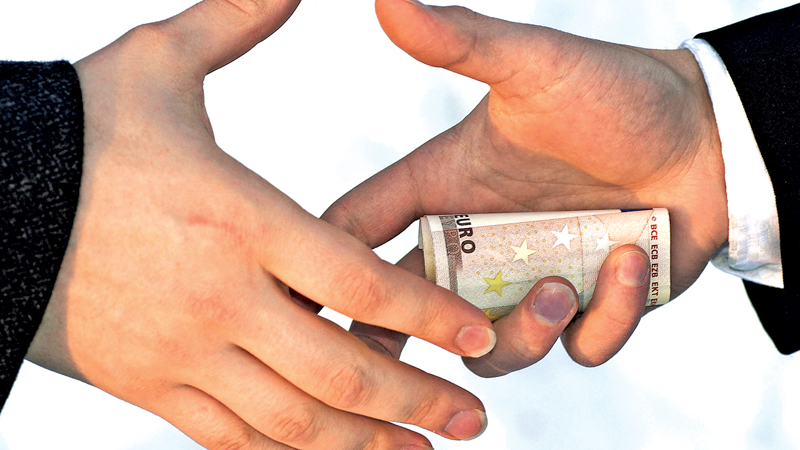 Our level of corruption is far higher than the majority of other developing countries around the world. For example, we are 91 least corrupt nation out of 175 countries, according to the 2017 Corruption Perceptions Index. And, Commission to Investigate Allegations of Bribery or Corruption (CIABOC), recently revealed that according to their surveys done on the public sector, 25 per cent of public sector officials are corrupt. The latest unfolding scandal involving former President Mahinda Rajapaksa and his election campaign of 2015, along with dozens more in the past many years, raises a question in the minds of ordinary citizens: how we regulate officials who are elected to regulate us - the public. In reality, there are many different types of corrupt practices, all of which fit the classical definition of misuse of resources for personal gain, and each of which requires different solutions. Of all those corrupt practices, political corruption is the most notable crimes of the modern era. A classic example of political corruption in Sri Lanka. We have seen in the past years how cases of unscrupulous politicians and the abuse of power have become surprisingly common in Sri Lanka. Political corruption can come in many forms. They may be payoffs and bribes, graft and embezzlement, blackmail and extortion and preferential treatment like nepotism and patronage. Corruption connected to elected officials and politicians can undermine the integrity of Parliament and the democratic process in a number of ways. Organised groups may seek to corrupt the public procurement systems for financial gain; Corrupt private sector professionals can provide organised groups with access to the legitimate economy; Local Government may be targeted by those who wish to corrupt local processes, such as housing or planning, for their own gain; and organised crime groups may target local officials to consolidate their safety in communities. There are many others. If the government is really determined to end political corruption, it must have at its core the full participation and involvement of young people. As the next generation of political and business leaders, civil servants, educators and community workers, the young represent the fundamental fabric of society. The government will need their engagement to achieve the three key ways to curb political corruption and to ensure the generational advancement of the community towards a better tomorrow. Today, the education system in Sri Lanka is quite out-dated. The required change would involve ensuring that school and university curricula are updated and modernized in line with societal changes and global developments. The emphasis, as at present, should not be limited to only the formal school or university setting. It should include the holistic education of the next generation through community and religious institutions, vocational and internship opportunities, and participation in public and political processes as an integral part of socialization. If we adopt such an approach, it would be more likely to bridge the gap between the younger generation and political institutions. Closely connected to the focus on education is the need to create a culture of integrity that is hard-wired in society. Although a comprehensive education system will foster a culture of integrity, we need to extend the efforts to other sectors beyond the young, such as top government servants, political leaders, private sector officers etc. If properly done, it will strengthen a culture of integrity that concentrates on high-quality service delivery and professional performance standards. It is up to the public to demand accountability from their political leaders, civil servants and private-sector actors. And this demand must be sustained through challenging times of political transition or economic downturn when the temptations for engaging in unlawful and corrupt behaviour will be at their highest levels. Translating these three key focus areas into concrete action can help free the country from corruption and lead to long-term sustainable development. However, it is a long-term process but the country needs the short-term solutions, also. For short and medium-term solutions, perhaps we could pick up few lessons from Organisation for Economic Co-operation and Development (OECD). In one of their recent reports on the elimination of political corruption, they state: “Traditional approaches based on the creation of more rules, stricter compliance and tougher enforcement have been of limited effectiveness. A strategic and sustainable response to corruption is public integrity.” The report further says: “To effect change, action should go beyond the executive and government. The legislative and judiciary bodies and individuals and the private sector must get involved. Rendering information publicly is not sufficient but should go hand in hand with effective scrutiny and accountability mechanisms.” OECD also recommends few strategies. We do have anti-corruption bodies and accountability measures at national levels. While strengthening and empowering them to the highest level, there is also an urgent need to promote a political and cultural environment which is conducive to a corruption-resilient society. Such an initiative should: (a) take into account the diversity and richness of our cultural traditions and make the stakeholders be aware of them, (b) receive strong grass-root level backing from a broad coalition of groups in society who are opposed to existing corrupt practices, (c) be flexible enough to adapt and respond to new forms of corruption as they emerge.